Businesses that depend on paper are discovering the value of enterprise content management (ECM). An ECM solution provides electronic capture of documents, automated processing, optimized workflow and seamless integration with existing applications. Building an ECM strategy based on your business requirements means taking a closer look at the software’s functionality and seeing how document capture, access, processing, integration, storing and measuring can work for you. Learn more about how business leaders can make the case for the right ECM solution by demonstrating how it will help not just the organization, but also users. 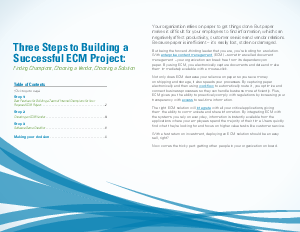 Understanding the steps involved in implementing an intuitive solution will bring your organization closer to realizing the benefits of an ECM system that evolves with your business needs.